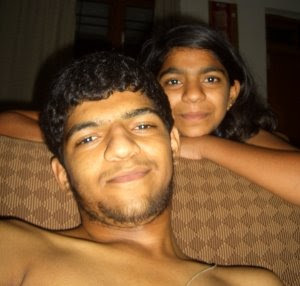 Rule No 1 Of Siblingry: Arguments are part and parcel of a siblings life. And logic has absolutely no place in these arguments!! Now believe me when I say that me and my kid sister respect this rule like its the 10th commandment!! 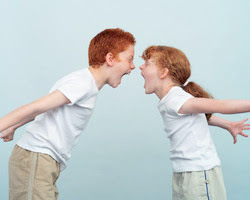 Infact I'd rephrase the rule to read something like "Thou Shalt Argue Illogically With Thy Sibling Atleast Once Everyday" for more of a dramatic effect!! Infact I think this rule is more universal than any of the other 9 commandments!! Don't believe me?? Read on my friend, and be dazzled by the idiocy portyared by yours truly!! This is NOT fiction. This conversation actually occured on today evening. Me and my sister* were having a huge argument over how I'd murder someone and not get caught. (This may sound a very gloomy topic to be discussing but it was very relevent at that time because we'd just finished watching the movie Zodiac which is based on a true story of a serial killer). I kept coming up with many many ideas and she contradicted me everytime. "I'll kick him off a cliff" I said, but then she argued that even toe prints are distinctive like finger prints (She's right apparently). So I thought for a while and then came up with my solution..... "I'll kick him off a cliff and then...... I'll chop off my legs, and use a pair of prosthetic limbs instead for the rest of my life". I then looked at her waiting for her to say something stupid to contradict my "Plan par excellence". She thought for barely 5 seconds, smiled, and then said "Why don't you just wear a pair of socks when you're kicking him off?" D'oh.... So simple!! Why didn't I think of that?? My plan had a monetary cost of a few lakh rupees, and me losing my legs forever, while her idea cost me barely Rs.50-100 (plus I maintain all my limbs intact!!). You have no idea how moronic I felt when I realized the simplicity that this 12 year old had used to solve a problem that my "to-be-engineer" brains couldn't figure out!! *This is a pic I took just now of the two of us!! Linux +Watchmen = Vacation Masti!! College vacations have just started a week ago, and already I've gotten so much stuff done, that I seriously feel that going to college anymore will just be a waste of my time!! Random thoughts apart, this post is about two amazing things I did over this past week. Reading my first graphic novel!! Always having atleast 2 computers at home means I can always be messing around on one of them and generally messing around means experimenting with OSes. I've had a computer running various distros of Linux on a rotational basis for nearly a year now. However, thanks to my other priorities, I never really got my hands into Linux that much. Now, finally that I've got the time, I've started moving towards linux as much as possible!! 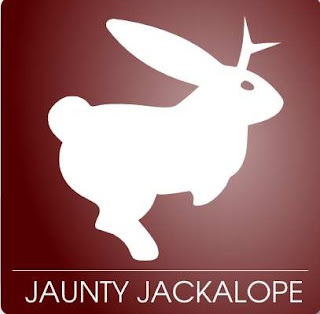 I started off by getting rid of Backtrack 3, which I'd installed to run some network tests on a friends remote network, (but which was since that day lying there almost unused), and then installed Ubuntu 9.04 (Codename: Jaunty Jackalope). After a smooth install,I was greeted by the linux boot screen. Post logging in, I noticed that all my hardware was recognized and functioning properly [Now that's what you call "working-out-of-the-box"]. Anyway, this perfect picture of Ubuntu 9.04 lasted only until I rebooted!! Once that was done, it seemed I couldn't get my audio driver to function past the login screen!! So I went to the Ubuntu forums and noticed that quite a few people had similar problem and the Gnome ALSA mixer seemed to solve the probem for them. I tried the same, and a few minutes later, music flooded my room once again!! Now being the true computer junkie that I am, I decided to work with terminal commands as much as possible!! Crazy idea but awesomely fun!! But now lets shift the focus of this post to point 2. The people who guard our societies in the nights, whistling every now and then to scare away the badmaash gundas who're out there with the sole aim of looting you while you snooze.....But NO, I'm not talking about those guys!! I'm talking about the new movie with the same title that is said to among the best in recent times. Even IMDB users have rated this movie 8.0 on 10. Wow, I had to watch this movie!! 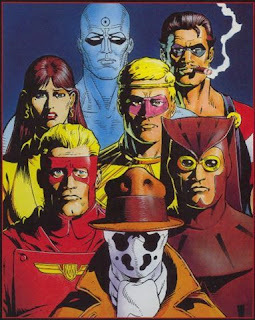 However, I read that the movie was infact an adaptation of a 12 part graphic novel by Alan Moore. And apparently, the novel was a super duper hit back in the late 80's. Being the ardent tweeter that I am (follow me), I asked some of my fellow tweople what they thought of the movie, and the book. Some of the tweets were amazingly informative. I soon realised that this book actually has a cult following!! One day, by mistake, I called this novel a "comic", and around 15 people tweeted back telling me to change that the word "comic" to "graphic novel"!! Then I read this(Read the second half of the article). I also read on wiki, that not too long ago, the novel was considered by Hollywoods top directors, to be too dark and complex to be made into a movie!! Then finally someone said "People who watch Watchmen movie without reading the comic should be burned alive!". Ooh.. so I decided to read the comic first. I downloaded all the 12 issues and then found that the downloaded files were in some strange .CBZ format. A little research later, I found that .CBZ is a format specific for graphic novels. This started my hunt for software that could display .CBZ formats. And this is where the 2 points collided. The first software I found that seemed to do the job, was a software meant specifically for Linux, and guess what its name was?? It was Comix!! Take that Watchmen fans!! Reading the novel was a joy, firstly because it was my first proper read in a loooooong time, secondly because it was my first graphic novel, and thirdly because it is an awesome awesome book!! Comix is a piece of brilliant software and runs very smoothly on Linux . By the end of it all, I have become a huge fan of both Ubuntu 9.04 and Watchmen. I'm really planning to get more into more graphic novels especially ones that have been adapted into movies or TV series such as Black Hole, V for Vendetta and 300 (The latter 2 being among my most favourite films of all time!!). 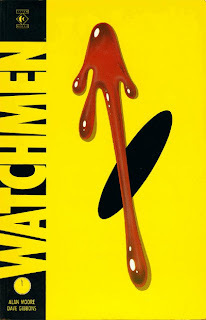 I watched Watchmen (the movie) a few days after reading the novel, but I'll save my comments on that for my next post, hopefully by the end of next week. I've absolutely fallen in love with Ubuntu 9.04 and plan to make it my permanent Linux distro. Now, I'm pretty sure, that if you've read this far, that you're interested, either in Watchmen or in Ubuntu 9.04..... so its time for some links!! U can do what I did, and download the all twelve parts as a single torrent download from here. The torrent, at the time of writing this post has ~150 seeds which is more than enough for a fast download. You can watch a trailer of Watchmen the movie on YouTube. You can download Ubuntu 9.04, you can download the disc image either directly or using the BitTorrent protocol from the official Ubuntu download page . The page even offers downloads of the earlier version of Ubuntu (Ubuntu 8.04 Codenamed Hardy Heron). Comix, the comic book reader is open source, just like Ubuntu, and can be downloaded here. P.S. A day after writing this post, I uninstalled Ubuntu 9.04 from my system and installed Fedora 11, which is another awesome Linux distro (codenamed Leonidas. Yeah, after the hero of the graphic novel 300!!). So much for my love of Ubuntu 9.04!! cheers! !